The artist formerly known as Extension Entertainment, now known simply as exfm, has officially gone mobile today, releasing its first mobile app for iOS. I’ve been enjoying exfm for a few months now through the startup’s Chrome extension, so I’m very excited to be able to finally bring that experience with me on-the-go. For those not familiar, exfm is a social music discovery platform that basically turns the Web into your music library. As you go about your daily web wanderings, exfm’s extension dutifully gathers each and every MP3 file that crosses your path, collecting these tracks into a music library that users can play, organize, make into playlists, and share with friends. For anyone who’s ever said something along the lines of, “now what was that awesome track I heard earlier today on that music website? I can’t remember, I guess I’ll have wade to go through my browser history to … ah, nevermind”, exfm is for you. With the entire Web as exfm’s canvass, this means that music lovers have access to some 20 million songs — at least half of which weren’t created Lady Gaga. That’s a fairly robust library, to say the least. Back in December, exfm added Twitter, Facebook, and Tumblr integration to its suite of features, and because exfm remembers where it found the songs, it can stream from the host site at any point, even if you don’t revisit the page — and see what others are listening to on your favorite blog and social media sites. Of course, exfm doesn’t just autoplay every song on a site while you’re there, it simply indicates how many songs its found, allowing you to “play all”, or hear individual songs and add them to your queue. 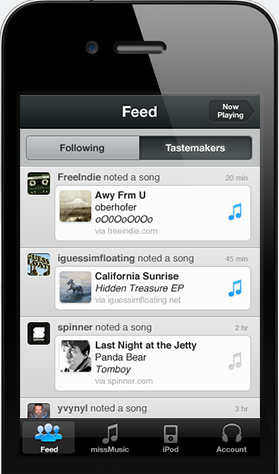 What’s more, the extension’s equivalent of the “like” or “favorite” button is “note”, which allows you to tag (or note) those songs on your exfm profile so that your friends can see what you’re listening to. exfm’s iOS apps take all the functionality of its extension, like access to your noted tracks, a feed of songs from people you follow, and adds a few cool new features like a “Tastemakers” section, which automatically pulls in songs from music blogs like Spinner, MTV Hive, I Guess I’m Floating, and more. Another two noteworthy features are the app’s Last.fm integration, which lets users scrobble their music to Last.fm, and access and play all local music files stored on your iPod — with the built-in iPod controls in tow. And, hey, complementing local play is the ability to easily purchase songs from iTunes, just in case you’re itching to buy that song and play it across your devices. Since it’s inception in March 2010, the platform has gained nearly 50K users, and there’s no doubt this number will explode with this nifty little Pandora and Last.fm companion hitting iOS. exfm raised $750K in seed funding in April of this year from Spark Capital, Betaworks, Founder Collective, and Dave Morgan, adding to the $500K it raised back in May 2010. All in all, exfm’s iOS app pretty much the bases, and for version 1.0, it works pretty well. Not too many kinks to speak of. Check it out on iTunes here.